Cooler cores are easily accessible for quick clean-out. Engine-mounted belt-driven cooling fan delivers efficient, reliable performance. 2.47-m (8 ft.) overall height and 1.90-m (6 ft. 3 in.) width enable the loader to navigate low and narrow entryways. Low center of gravity and exceptional balance yield impressive stability and full-turn tipping-load capacities. Precise parallel control over the entire lift range helps ease material handling. Hydrostatic transmission's low and high ranges provide travel speeds up to 20 km/h (12 mph). Standard canopy or optional air-conditioned/heated cab lets you choose the right operator environment for the job. Articulated steering delivers a tight turn radius for excellent close-quarters maneuverability and fast work cycles. 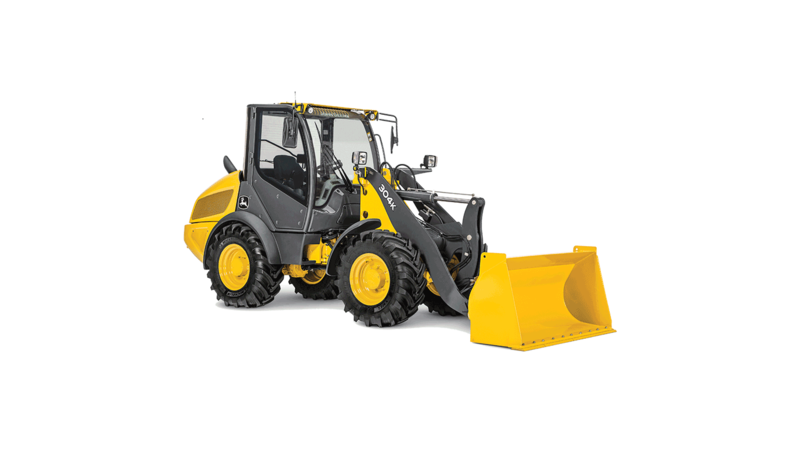 The pushbutton-actuated skid-steer-style coupler lets an operator attach and release attachments quickly from the seat. What's more, the coupler doesn't require special adapters that reduce bucket breakout or rollback. Lockable easy-open tilting hoods provide convenient, ground-level access to daily checkpoints. Transverse-mounted engine provides convenient access to dipsticks and filler necks.